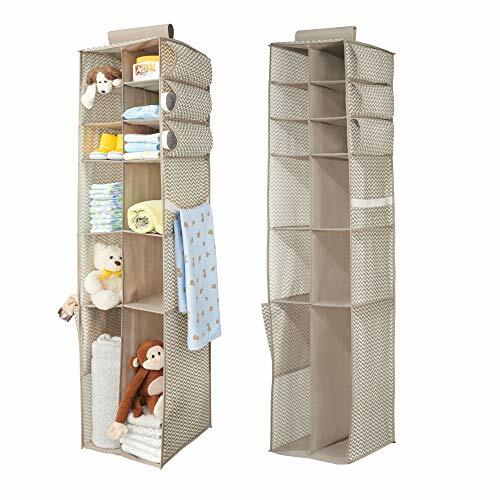 This Hanging Baby Nursery Organizer from mDesign offers a range of storage options for keeping your baby's essential items neat, organized and easy to find. Featuring 16 pockets of varying sizes and a side strap for hanging items, it is a great catch-all organizer for storing blankets, stuffed animals, diapers and more in your baby's nursery or toddler's bedroom! Use the strong grip strips to hang it from a closet rod for easy, hardware-free installation without the hassle. VARIETY OF STORAGE OPTIONS: Features 12 front pockets, 4 side pockets and a side strap for storing and organizing blankets, stuffed animals, baby clothes, diapers, towels, wipes and more in a fun zig-zag pattern!